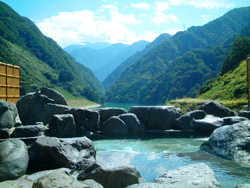 Your staying hotel with hot-spring will be at Unazuki, a well-known sightseeing spot. We hope that you will fully enjoy Japanese culture and delicious cuisine. You can choose a hotel either from Japanese style hotels or regular economy hotel with bed(s). Two meals of breakfast and dinner are normally included in a Japanese style hotel. Accommodations Plan with no dinner on September 4 and 6 will be arranged. Reception and Dinner on Sunday, September 4. Banquet on Tuesday, September 6. Please be careful for the meal plan when reserving at a Japanese style hotel by yourself. Two meals of breakfast and dinner are normally included. Only breakfast is included at economy hotels in Uozu and Kurobe city. your hotel and be aware that bathing suit is not be allowed. Meals will be Japanese cuisine at a Japanese style hotel and you could request your special order beforehand such as no-allergic cuisine. 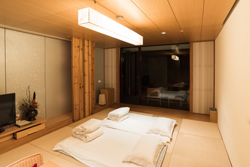 Your room will be Japanese-style on a twin, triple or quadruple sharing basis which is an individual bedding is spread on tatami(straw-mat) floor. The times of breakfast and dinner are set. Kindly make sure at check-in. In case your arrival is expected late, you may not be able to be in time for dinner. We suggest that you will schedule your itinerary to arrive at dusk. 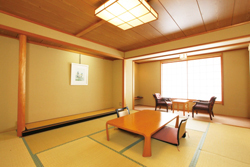 In case you do not wish to stay in a hotel at the hot-spring resort or prefer a single room, you may reserve at hotels in neighboring cities of Uozu and Kurobe. Free shuttle bus service is available between hotels listed on the reservation page and the conference site. 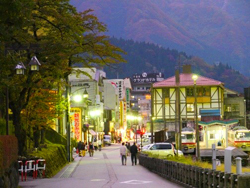 It’s about 30-40 minutes by train from Unazuki Onsen Station (conference venue) to stations near the hotels.